LONDON, UK / ACCESSWIRE / March 12, 2019 / Superbrand, in its second year and run by the British Franchise Association (bfa), will see some of the world's largest franchisors and most successful franchisees come together to network, learn from one another and look to expand their franchising options, held at the Institute of Engineering and Technology (IET), London, UK, on May 16. This year the topics will be split into three, depending on what attendees are looking to get out of the event, where you can attend any one of three key zones at any time to ensure whatever you are attending is particularly relevant to you. 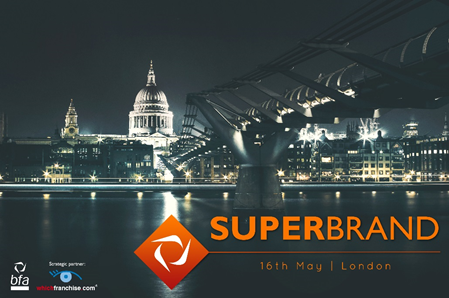 The Superbrand Zone is for UK franchisors and will look at the challenges and legal issues as you scale up your brand, as well as franchisors sharing their experiences of exponential growth and moving a UK franchise system model into the United States of America. The UK Developer Zone is for international franchisors. This will delve into areas such as the feasibility of you being able to expand in the UK marketplace, the legal framework in the UK, finding the right franchisees and also details of how to take your brand to Europe. Finally, the Franchisee Investor Zone is targeted for multi-unit franchisees, with speakers who will give practical advice on scaling up and acquiring more franchise units, ensuring you get a good return on investment, and developing your team and managing them successfully. The day runs from 09.30am-17.30pm, where there will be a networking drinks reception at the end. Pip Wilkins, CEO of the bfa, stated: "This year the Superbrand event will be even bigger and better, ensuring that a wide range of people involved in the franchising industry can really get a great deal of value from the day. Whether you are a multi-unit franchisee looking to scale up, are thinking of expanding your franchise internationally, or looking at how to continue to grow your brand in other ways, the expert speakers and panellists will help you. "Our recent 2018 bfa NatWest Franchise Survey shows multi-unit ownership is on the rise in the UK. This is testament to an industry that is thriving, with franchisees growing their portfolios through the acquisition of more units, either with the same brand or different ones. This speaks volumes for the benefits of having a career in franchising." Speakers at the event include legal experts within franchising, franchisors from some of the world's most recognised franchise brands, franchisees that own in excess of 100 units with multiple brands and other professionals in franchising. One keynote speaker is Michael Heppell, a best-selling author and regarding by many as one of the world's best speakers, focusing on self-belief and building confidence, getting out of your comfort zone and being a futurist. The vision of the bfa is to empower, promote and connect people in business by becoming the leading educator in franchising. To support this vision, the association has established a Franchise Training Academy to be the fundamental source of key skills and techniques, driving the adoption of best practice in the UK franchising sector. The education of potential franchisees and franchisors is at the heart of what the bfa is and does. Equipping prospects with a crucial understanding of franchising is essential not only to their success, but to the success of the whole sector.